6 Pack Fitness was founded to create innovative solutions for keeping athletes on target with their fitness goals, no matter where the day takes them. Inspired by design and serious about function, the Innovator bag easily carries your gym gear, meals and sports nutrition products from point A to point B. The Innovator is made with 1680D polyester and 100% ballistic Nylon with reinforced bottom to ensure strength and durability. Two reusable freezer gel packs (included) and a fully insulated interior keeps meals fresh and cold for up to eight hours. The gel packs are vertically oriented, maximizing your meal carrying space. The front of the bag opens to reveal an adjustable shelving system that accommodates and keeps independently accessible, three (Innovator 300) or five (Innovator 500) Snap Lid meal containers (included). Two generously-sized side pockets can hold beverage bottles, utensils and fruit. 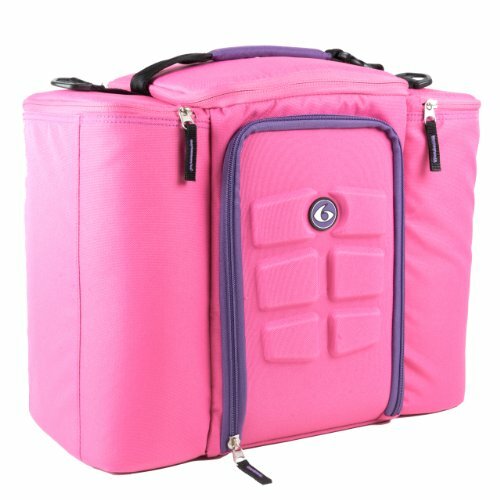 On the top is another zippered compartment that allows access to a Sports Nutrition Container (included) for organizing supplements. Snap Lid Containers are leak-proof, BPA/PVC-free and are microwave/dishwasher safe. Hand strap and deluxe padded shoulder strap for maximum carrying comfort. One year manufacturer's warranty. 300 model: 17.5 x 9.5 x 9.5 Inch, weight 5 lbs; 500 model: 17.5 x 9.5 x 13.5 Inch, weight 7 lbs.